This really is the best apple cake. The kind of cake that you want to sneak nibbles from and know your diet is doomed if you keep it in the house, especially since your kids are at college and not home to save you from yourself. It’s so moist and cinnamon-y and that cream cheese frosting is just to die for. I brought half the cake to our neighbors house, they could share it with 6 people. My waistline loves them! It was a hit! Then guess what? My kids came home for the day and of course I sent them off with apple cake! They couldn’t believe how delicious it was and were raving about it. Of course I received extra hugs and kisses for being such a great Mom bestowing baked goods to my starving College Kids! All of the ingredients that you will need. 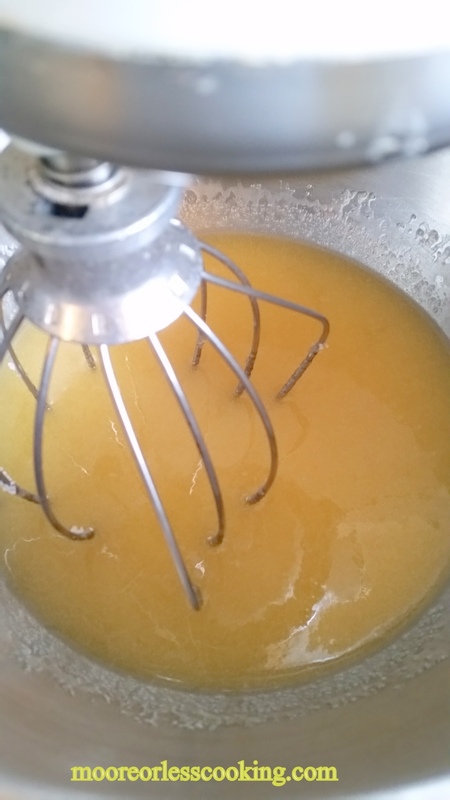 Add Vegetable Oil to eggs in a mixer and beat until foamy. Add sugar and Vanilla together than add to egg mixture. 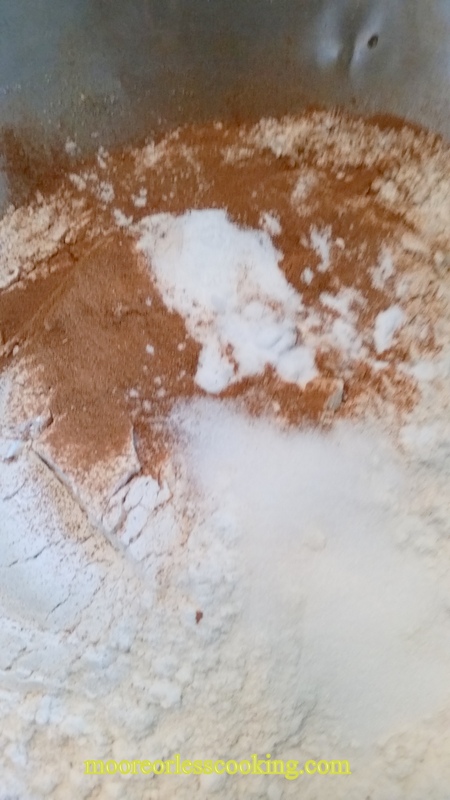 Mix together flour, cinnamon, salt, and baking soda. Add to mixture. 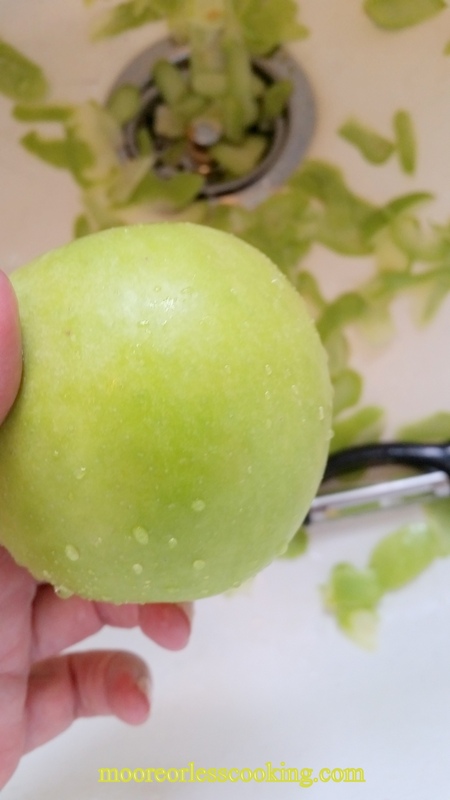 Wash, peel, core, slice apples thinly. Cake batter will be very thick. 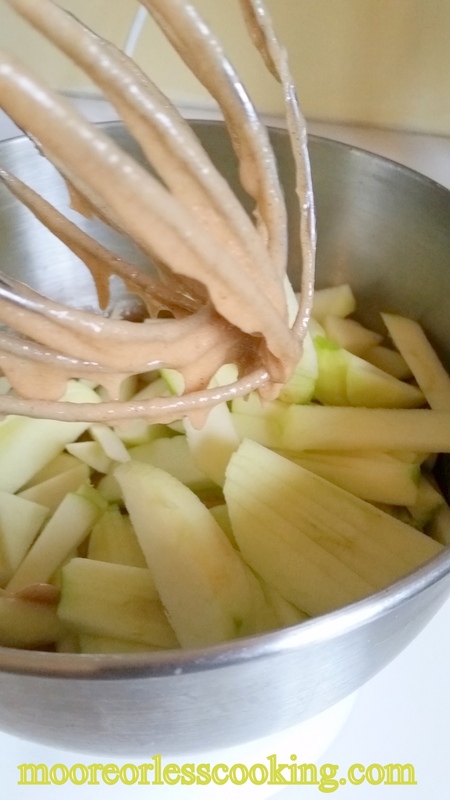 Fold apples into batter with a spatula or large spoon. 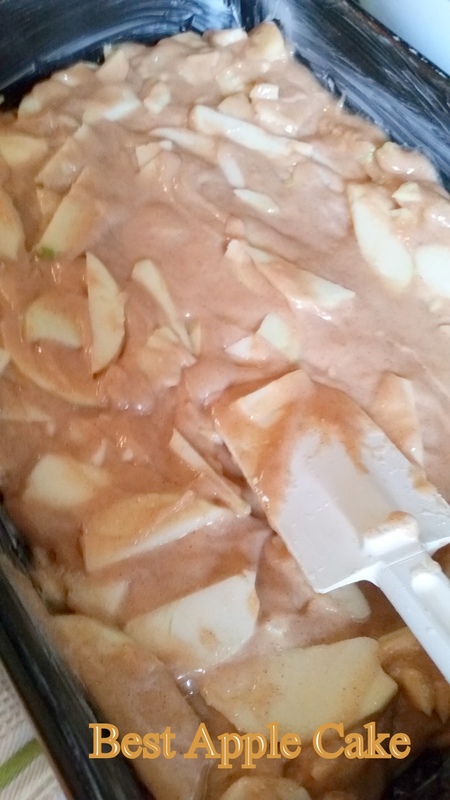 Pour Batter into greased 9 x 13 inch baking pan. Bake for 40-50 minutes, until golden brown and sides come away from pan. Using a toothpick, check to see that no batter sticks and comes out clean. 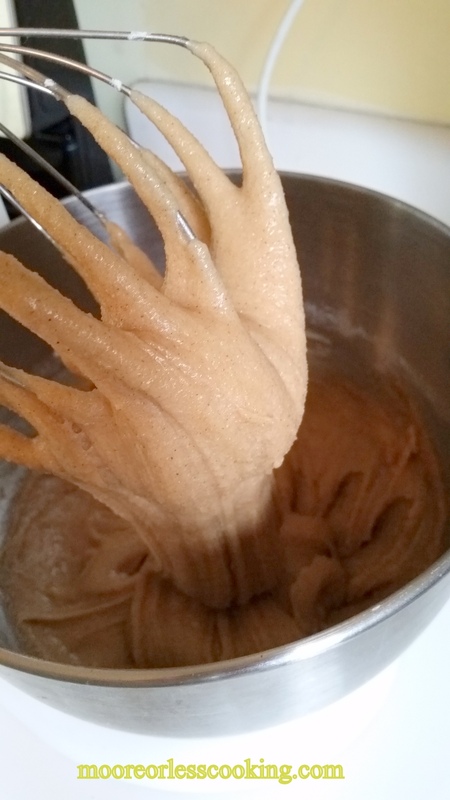 Mix all frosting ingredients together until smooth. 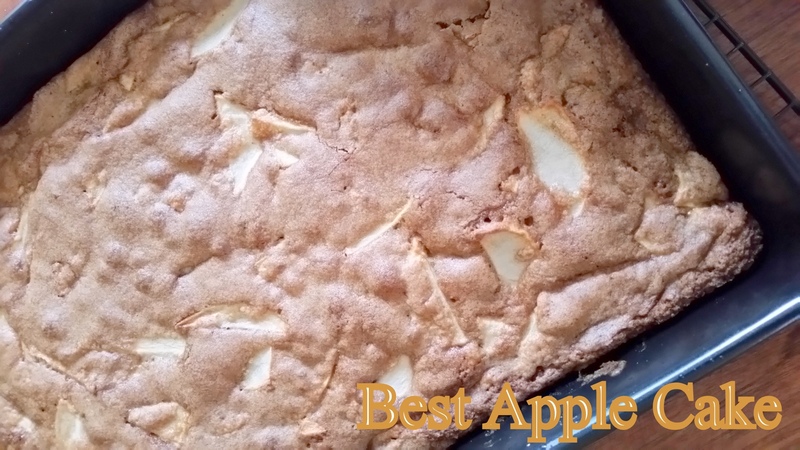 Delicious and moist Best Apple Cake! 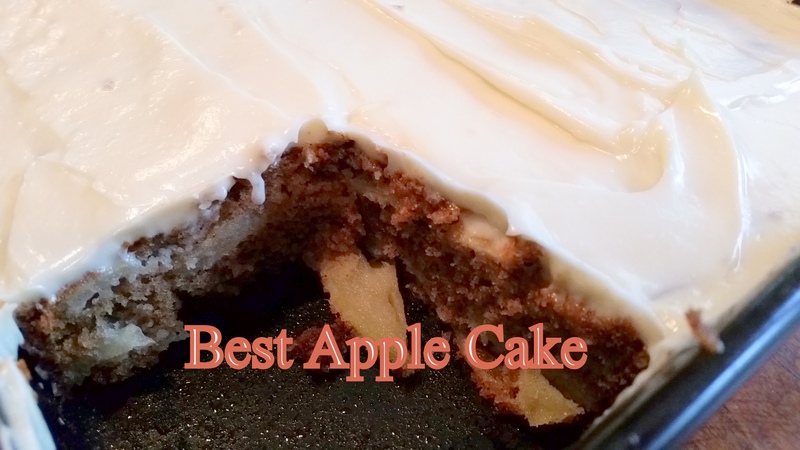 The Best Apple Cake. Moist and so flavorful. 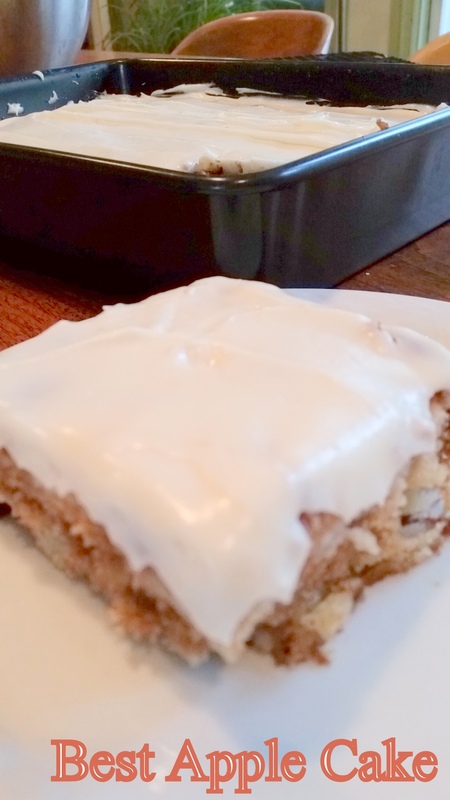 Topped with a rich Cream Cheese Frosting! Preheat oven to 350 degrees; grease and flour a 9 x 13 baking dish. 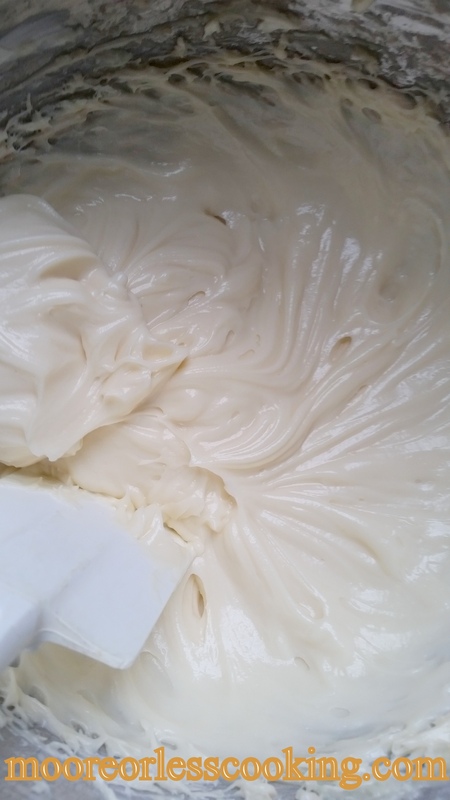 Add vegetable oil to eggs in mixer and beat until foamy. Add the sugar and vanilla and mix. Add the flour, cinnamon, salt and baking soda. 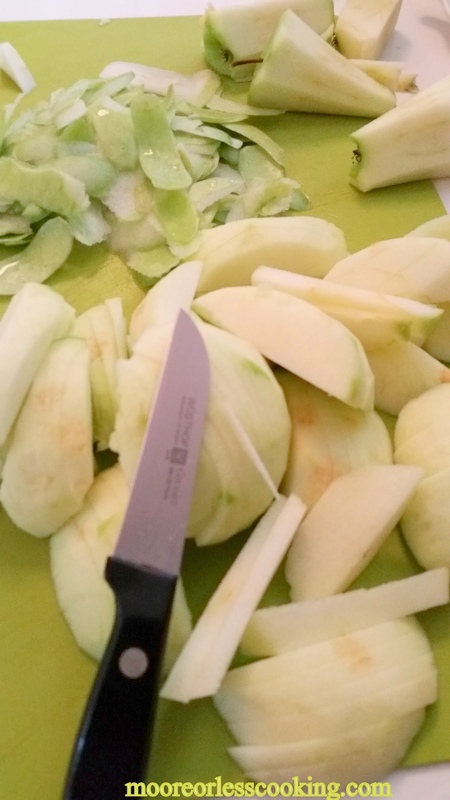 Add thinly sliced apples by folding in with a spatula. This was one of my dad’s favorite cakes. We always baked it in a tube pan and it didn’t have a glaze or frosting. I love that frosting myself! Thanks for sharing this; pinned! 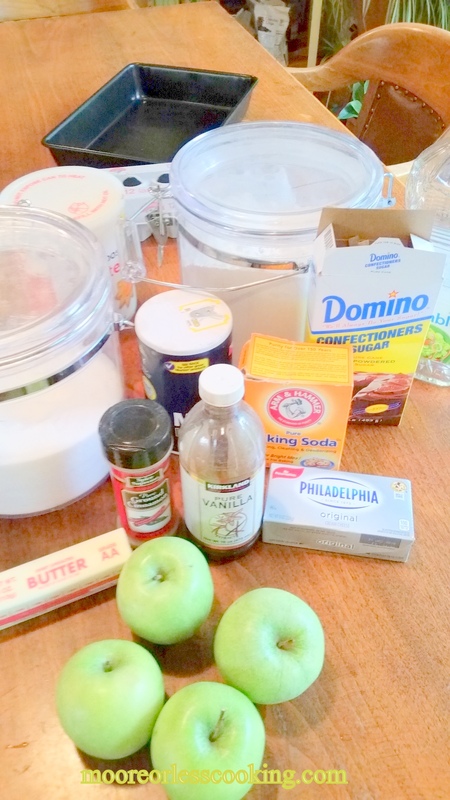 I made this cake yesterday and the only thing I did different was I diced the apples and added walnuts and instead of cream cheese frosting I used cool whip trying to save some calories. OH MY GOSH THIS IS GOOD. Its not to sweet, and it’s very moist. This cake is dangerous!!!!! Thank you so much for sharing this recipe!! 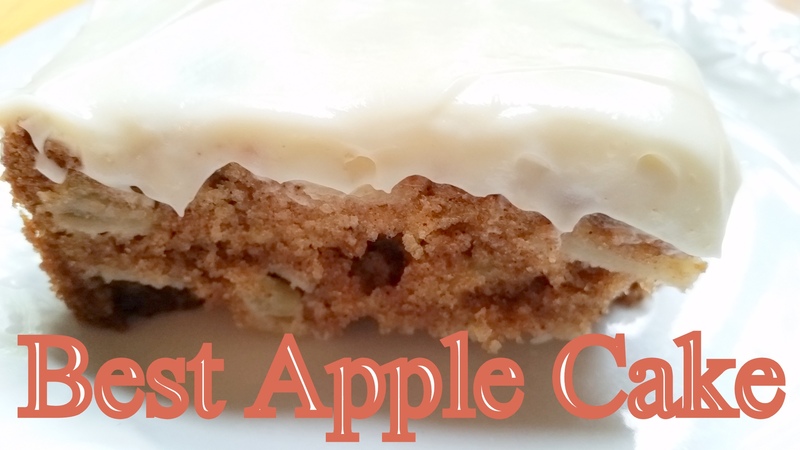 Hi Nettie, I had to write to tell you about your wonderful and I mean wonderful best apple cake. I made your recipe yesterday for a brunch group of people. There were other cakes also, and when I was sitting outside talking, a woman came outside and said what bakery did you buy that cake from a few of the people love it so much. When I told them I made the cake from Moore or Less cooking they were astounded. So I checked my cake and half of it was now gone. So I went back to again speak to the people I was with and when I returned, honestly, not a crumb was left in my 9X13 pan. I was really astounded. So I thank you very much for posting it and I am a queen for making it. I am already thinking of making your carrot cake for the next brunch. Will let you know how that one works out. Keep up the good work and I will continue to be a wonderful baker. Hi, this Apple Cake looks sooooo delicious. I have a question. 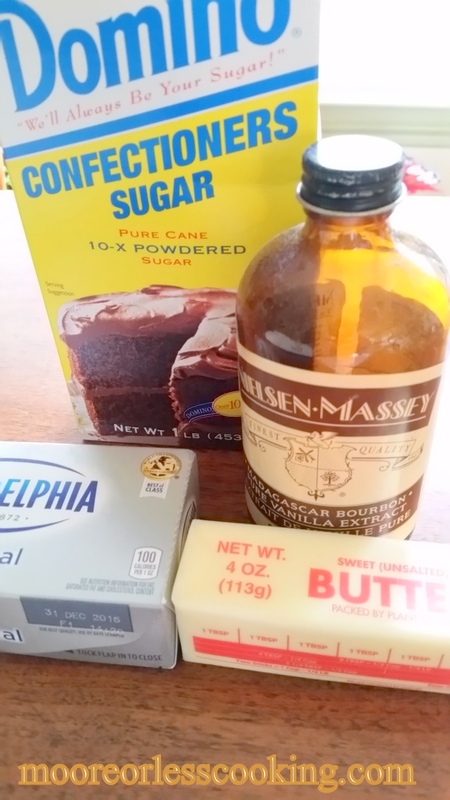 Can I double the recipe and still bake it in a 9×13 pan? and will the bake time be different? Thanks. 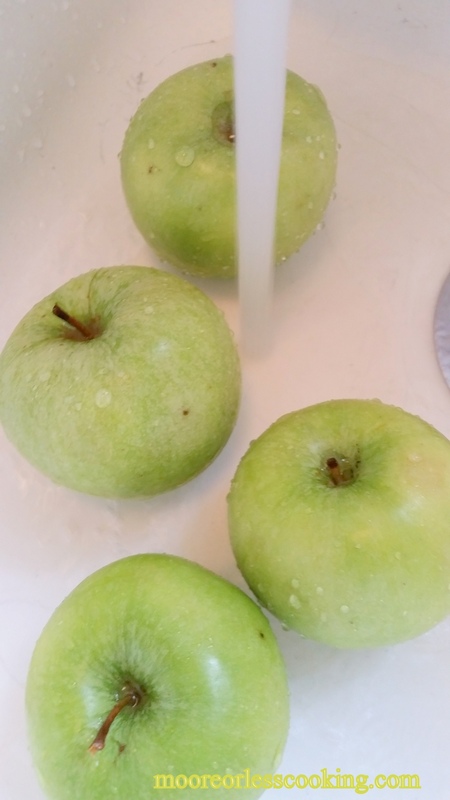 This is a wonderful apple cake recipe. For my recipe, I used a 9×13 baking pan. So if you want to double the recipe, I suggest that you use two 9×13 baking pans. The batter is very thick and I wouldn’t want to see your pan overflow. Enjoy!